But this dish is basically spring in a bowl. Or on a plate or whichever way you choose to plate this sort of risotto-like meal. This may be my first ever completely grain free dish on the site. You know how I really love my carbs, so um… this recipe is pretty out there for me (don’t worry though, it still has CHEESE…but only if you want it to, it can easily be made vegan as well). But just know, I would not be posting this if it was not down right awesome. 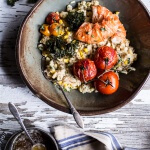 It might be kind of hard to believe that a grainless risotto is good, by I swear, it’s GOOD. 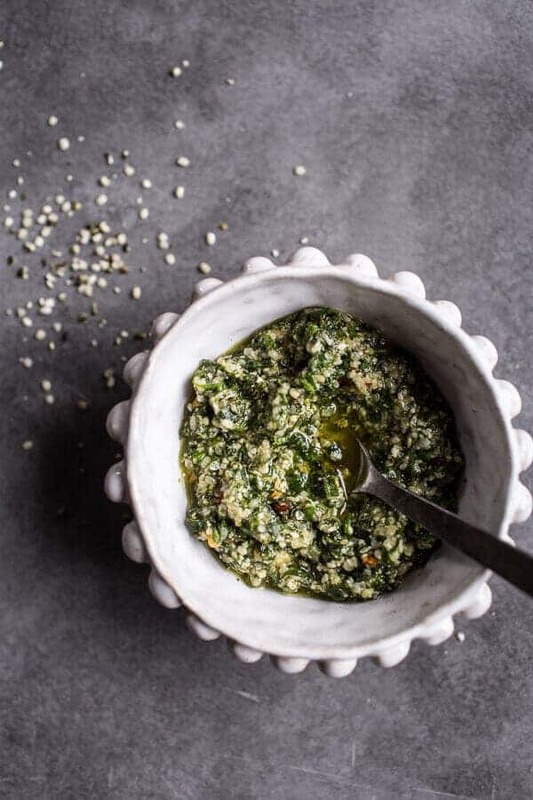 I will also admit that the hemp seed pesto has a lot to do with why I love this dish so much. 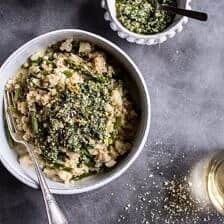 Don’t get me wrong, the risotto minus the pesto is still great, and a great meal to adapt and or build on the flavors, but put it with this pesto – perfection! So, I am kind of having a bit of a moment with a few ingredients/foods right now. One of those foods is pineapple (it’s coming…x like a lot), the other is matcha (it’s also coming) and the last is hemp seeds. I have been wanting to use them so much lately, but so far, I’ve only used them in recipes that I haven’t put on the site. 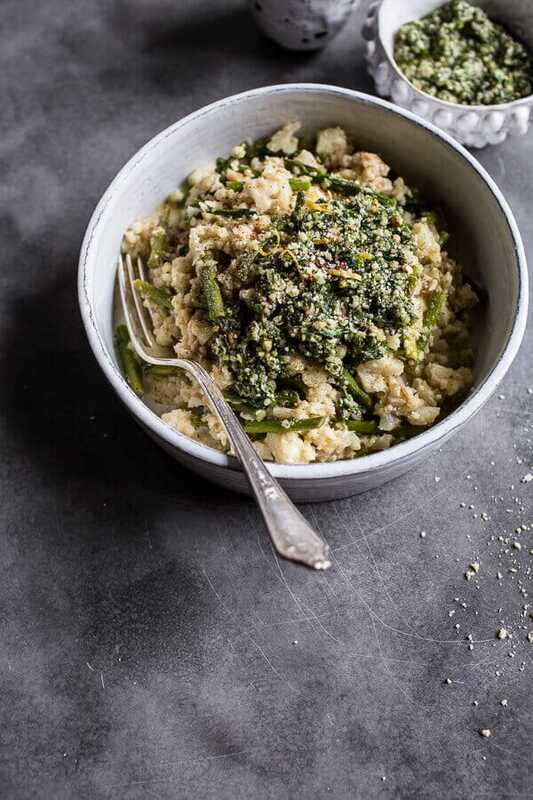 BUT, then I had the thought to make a hemp seed pesto, and then I thought, let’s do a cauliflower risotto, and then well… this recipe happened. It’s weird how recipes develop, huh? It’s always a different process for me, almost every time. Sometimes it’s so easy and ideas/photos just form in my head and other times it’s a little more of a struggle, but either way I think it’s funny to see how it all goes down. I love the process. I especially love the process when the recipes form in my head like this one did. I can picture everything…which for me is a huge plus because I am such a visual person. I love to see things, picture them, and then make them come to life, you know? It’s honestly how I have fun. UGH. Could I get any weirder? Probably not, but normal is boring anyway. So since normal is… oh so boring, that means this totally not normal, quick cauliflower “risotto”, is amazing. Yeah!! Also, it’s basically guiltless risotto. GUILTLESS guys. Heck yes!!! Ok, so here’s the idea. You make some cauliflower rice, which if you didn’t know is just shredded cauliflower, and it’s actually pretty satisfying. 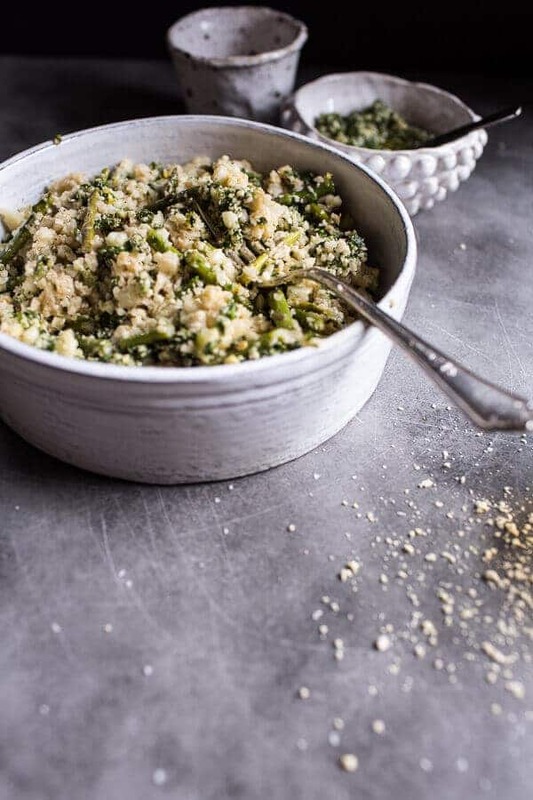 Then you use that cauliflower rice like you would tradition risotto rice (arborio rice). Add in wine, asparagus and a little cheese and you’ve just made a killer fake-out risotto. If you wanted to make this vegan, just use nutritional yeast or simply leave the cheese out…but I wouldn’t. Then, make sure you don’t skip out on the pesto. It’s my new favorite. I’ve been dipping toasted bread in the leftover pesto. Mmm<–Do this. You will be so happy! And if wine is your thing, I’d do that too. It’s Thursday. Live a little. 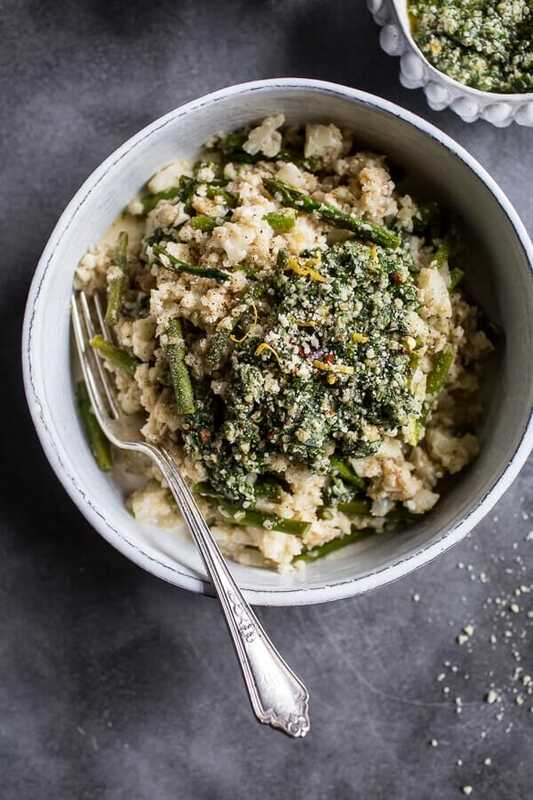 In a bowl, combine the cilantro, basil, hemp seeds, olive oil, lemon juice, garlic (if using), parmesan cheese (if using), crushed red pepper and a pinch of both salt and pepper. Taste and adjust the seasonings as needed. Add water to thin the pesto if desired. Heat a large, high sided skillet over medium heat and add 2 tablespoons olive oil. Add the onion, season with salt and pepper, and cook until caramelized, about 8 minutes. Then add the cauliflower and the garlic, and season with salt and pepper. Cook for 2 more minutes. Deglaze the pan with white wine and cook, stirring constantly, until the liquid is almost evaporated. Stir in the asparagus. Slowly pour in the veggie broth and coconut milk and bring to a simmer. 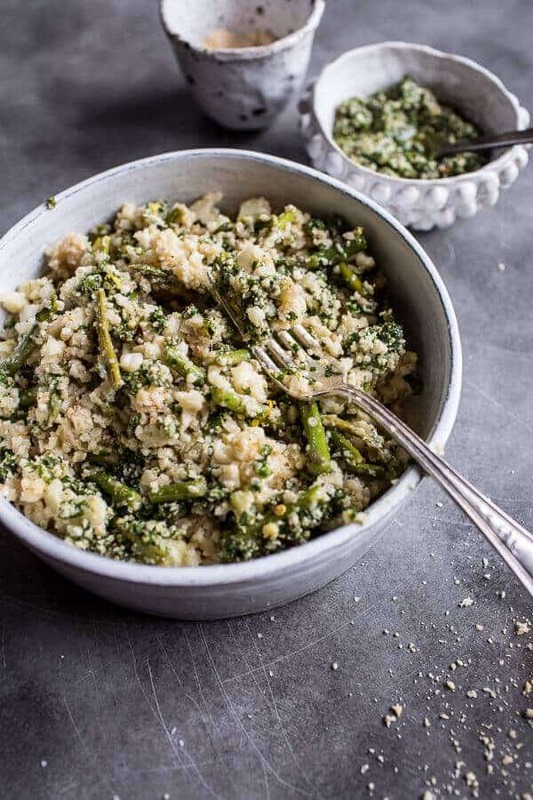 Cook until the cauliflower and asparagus are tender and "risotto" is nice and creamy, about 6 to 8 minutes. Remove from heat, then add the lemon zest, parmesan, parsley and a drizzle of olive oil (or truffle oil!! MMM!). Divide the risotto among bowls or plates. Top with pesto and a drizzle of truffle oil if desired. *You can either finely chop the cauliflower or run the heads through a blender or food processor. For the best consistency, I like to blend 3/4 of the cauliflower in the blender and then finely chop the remainder for a little texture. If you don’t do wine, like me, just add more cheese. Totally does the trick every time. I’m not sure I get how to make the cauliflower rice…you just process it until its in small pieces? 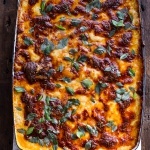 I have to give this a try because I love cauliflower. That’s how I do it! 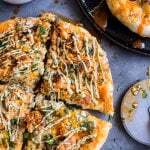 I’ve used it to make a pizza crust before – it came out ok, but I like this recipe ALOT better. My kids liked it though which was nice!! Anyhow, I love how this is grain-free, but there’s still cheese. They say there are two things women can’t resist in life 1.) cheese 2.) chocolate. I agree!! This looks really good Tieghan! I am so excited to try it! Thanks Tori! Hope you love it!! What a lovely Spring dish! The pesto looks fabulous. I think it would also make a great pizza base. I am totally on board with the use of hemp seeds, they are so great. Thanks Cara! Hope you had a great week!! This is perfection in every way. Spring…bring it on! I am ready for brightly colored salads, burgers and cocktails! Yes yes yes to spring flavors!! And I love your description of formulating recipes haha. Isn’t it so like that? Sometimes an idea will take me days to develop and other times the whole concept will just pop int my head when I least expect it. Either way, it is so much fun to think about. I definitely will have to try cauliflower risotto some time soon. I would never have thought to do that and it is such a great idea! Thanks for this fabulous grain-free recipe…it sounds amazing and I am totally going to try it!! 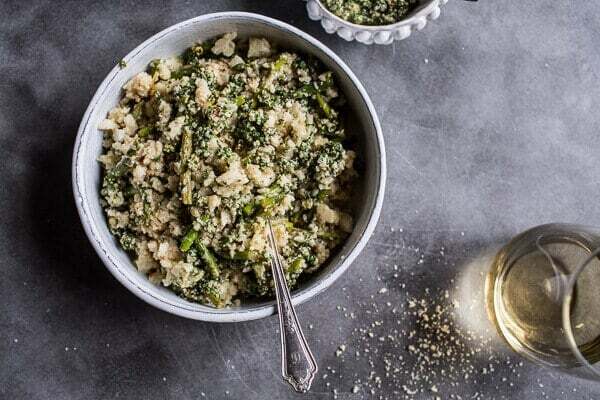 I love your idea of the pesto with cauliflower rice. 🙂 And thank you for all your continued hard work recipe developing!! This looks amazing, but we live in a pretty remote area and I know I won’t be able to find hemp seed nearby. Any suggestions for substitutions? Hey Joan! Just use you favorite nut. Pistachios, walnuts and pine nuts would be awesome, but any nut will be fine! I will take Spring in any form I can get it! I am so ready for sunshine and fresh produce! This looks great! Thanks Annie and me too! Love this! I posted a Romanesco “Rissotto” with Seared Scallops a few weeks ago and it was amazing. Great minds think alike I guess. 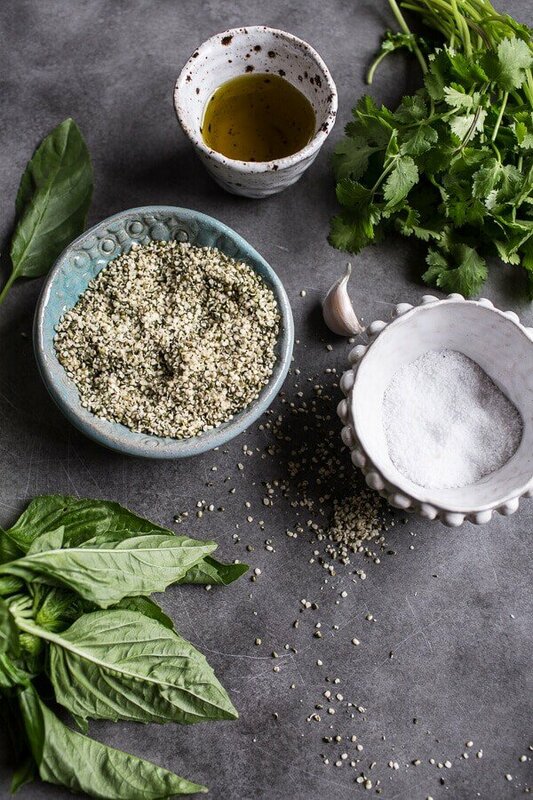 I Adore that hemp seed pesto, it would be good on so many things! It’s amazing what you can do with cauliflower these days. I like the idea of cauliflower and asparagus together–I also have a bag of baby peas from Trader Joe’s I’ve been waiting to use. Even though it’s getting warmer–I still like bowls of warm comfort food. Carla Hall and Jamie Oliver posted cauliflower risotto and I immediately fell in love. 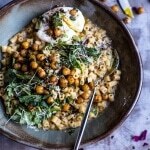 This cauliflower risotto is just like the other two meaning I’m swooning over this! Heh–I’ll raise a glass of wine to that. This is an awesome bowl. Cheers–we’re almost at the weekend!! This is on our menu for next week! I can’t wait to try it. I can’t get hemp seeds here in Australia so I am going to substitute pepitas instead 🙂 Happy Spring to you, we are looking forward to autumn here after a very long hot summer! Yes! 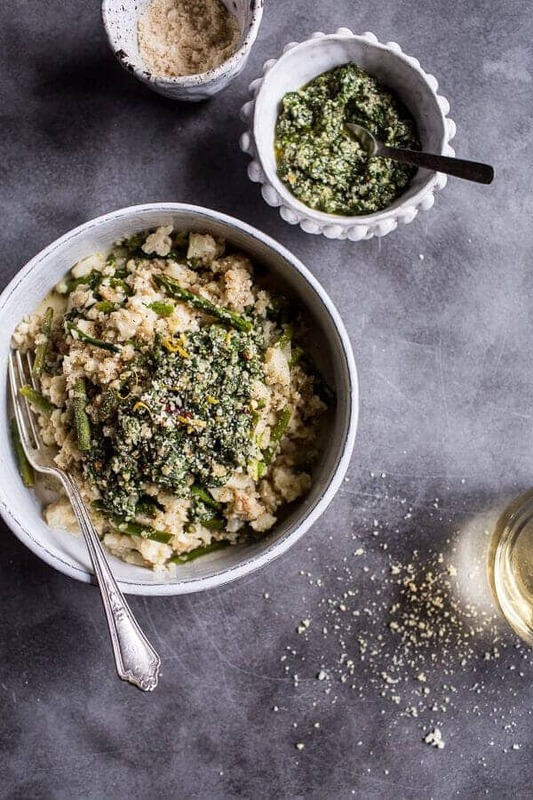 This is so spring in a bowl and that pesto is gorgeous! HA! Me too! Thanks Janet!! Just made this tonight. The risotto was so delicious with a little parmesan cheese on top. I forgot all about the pesto sauce in the fridge 🙁 Good news is I have some risotto leftover and i’m sure the sauce will be great when I eat the risotto tomorrow. It was SO good. Thanks! Haha!! Thanks Joy! So happy you loved this and enjoy the leftovers!! I’m a vegan and you’re the only blog I read every day for surprises like these! You’re the best. Coconut milk is so crazy high in fat…do you think the recipe would work alright without it? Or maybe with a substitute like almond milk? Almond milk will be fine. Hope you enjoy this! I loved this recipe. I was worried about the cauliflower when I was cooking it because it does not adsorb all the liquid like rice in risotto does. It ended up turning out amazing. Thanks for the recipe Tieghan!! It was so light and healthy tasting in the end. I loved the flavors in the pesto especially the cilantro. Another great one. You use a ton of coconut milk (which I love!). What brand do you like to use? So tonight I tried your very nice alternative to the traditional (heavier) risotto. I also really enjoyed your hemp pesto recipe. Thank you for posting. It was delicious! So happy you liked them! Thank you Claire! I would like to use cauliflower that is already riced. Do you know approximately how much I should use for this recipe? About 4 cups should be great!! Let me know if you have other questions. Hope you love the recipe! It’s actually a great and helpful piece of information. I’m glad that you shared this useful information with us.